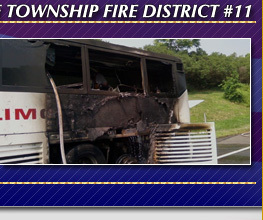 It was a busy night for the members of the Dist 11 fire dept. It started out on Oak Tree Road with a fully involved dumpster fire, followed by an illegal fireworks display across from the dumpster fire and ended with a structure fire on Coakley Ave. A quick dispatch, arrival and aggressive knock down by first arriving units helped keep the damage to a minimum. No injuries were reported to any firefighter or civilian. The scene was cleared in a couple of hours. Thanks to our mutual aid companies that came out to assist us. Iselin Dist 9, Colonia Dist 12, Fords Dist 7, Avenel Dist 5 and Hopelawn Dist 8, Woodbridge Twp Mutual Aid Coordinators, Woodbridge Twp EMS, Woodbridge Police and medics from JFK Hospital.